If you ever make your way to a labyrinth you'll have to watch out for the guardian who roams it. This half man and have bull does not take kindly to those who invade his space. So if you find yourself in a giant maze be sure to be as sneaky as you can when you make your way though it, because if you wake up the Minotaur you'll have to run. Take the bull by the horns when you're putting together your costume. Whether you picture yourself as a demon, a wild animal, or even a viking warrior, your costumed look won't be complete until you add this accessory. With this set one thing's for sure—you'll be able to charge into the party with confidence when you've got these horns on your dome! 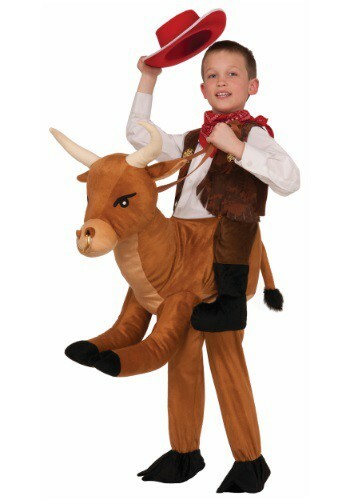 This Child Ride A Bull Costume will turn your little cowboy into the best bull rider in the circuit without any danger of injury! No matter how much that bull bucks and spins he'll stay strapped in well past 8 seconds!